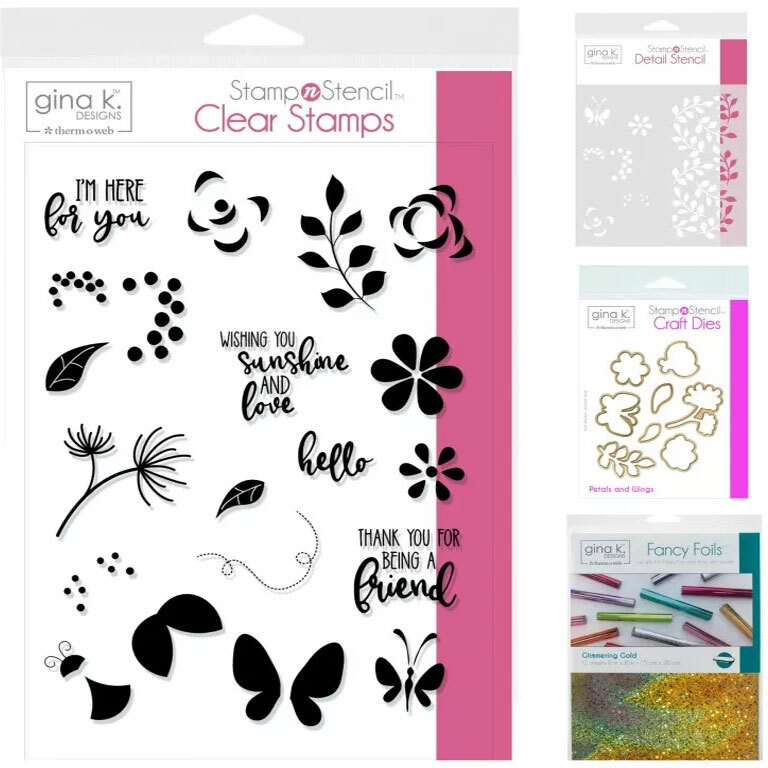 Our team is having a blast using the new Gina K. Designs StampnStencil system along with the unbelievably beautiful Glitz Glitter Gels. Look at these colors!! 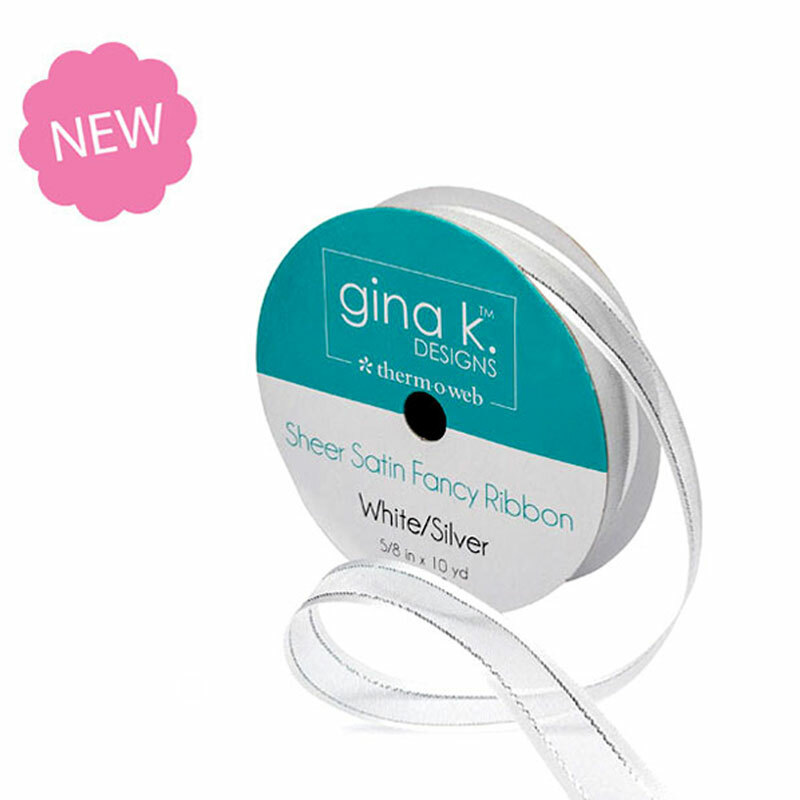 We also have a new ribbon - with SILVER!!!! I made three cards for this hop. 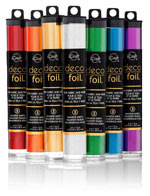 The first two use the new products exclusively and the third one uses an older GKD stencil with the Glitz Glitter Gel. Know what I love about the Glitz Glitter Gel? Once it is dry, it does not come off. I don't know what magic causes this, but it is the BEST! wow!! I love these both but that b/w one with the touch of color is so classy! Fantastic cards and tag. All of them are amazing. Great release. WOW! Such a fun projects and easy to use. 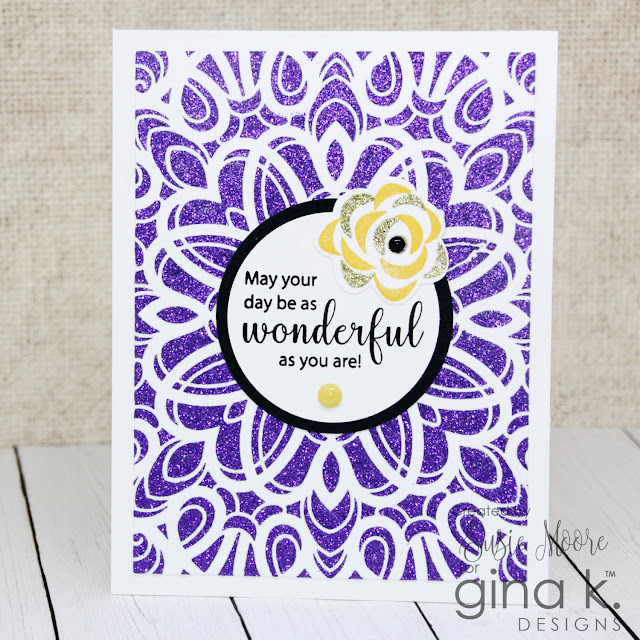 Gorgeous cards/projects!!! I want all the colors but will have to settle for just a few. The just bring a whole new element to the cards. Can't wit to try some! The purple is my favorite color so your purple card is the best. Your cards are so pretty; thanks! Beautiful cards. Thanks for the inspiration! The tag is my favorite! But all inspire creativity! Yep, the glitter gel is wonderful. Hopefully I can get all the colors soon! Love purple and what a fantastic new product glitter gel. Love your cards! Love the glitter gel! Thanks for sharing! I especially like the tag. It is so bright and pretty. I love the black glitter with the pops of pink. Just gorgeous! How did you do the tag? So pretty. 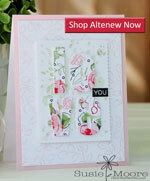 Beautiful cards, I can't hardly wait to get my order. 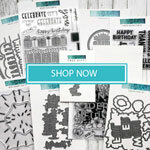 Great cards and products! Woohoo! Love that glitz! I love the color combination on the first card.. Very elegant.. Your cards are very lovely. Thank you for sharing! These are all beautiful!! I'm really loving the design of your first card! Very beautiful cards. Really like the purple one. These are sol wonderful! Really loving that tag. These look like you had fun! Thanks for sharing these ideas. Your three cards are very pretty. I love that this gel doesn't have glitter flying around. And the colors are so sharp. Love the blue on blue tag! Your colors are fun and the glitter gel is fantastic! Love your cards and tag, they're gorgeous!! Love the black and pink card!!! I love how you did BIG designs! Beautiful cards! I cannot wait to get my hands on this product!!! I just love the black glitter gel. Can't wait to try it. Thanks for sharing. I like the black and pink combination, but all are very pretty. 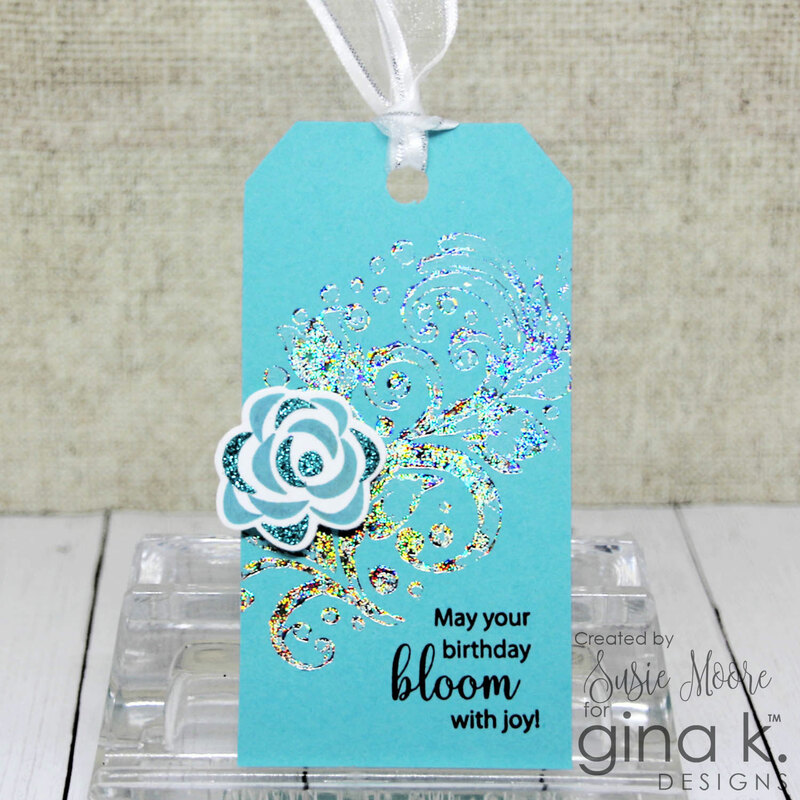 The tag with the foil flourish and the glittered flower is also cool. So pretty - I especially like the B/W with the pink for pop. love your card ideas!!! So much inspiration! Love your cards, can’t wait to get started using these products! Thank you! I love them all!!! Great job! Gorgeous cards. This Glitz Glitter Gel is amazing. I love the wonderful colors and it is so beautiful, especially with these wonderful stencils. Love your cards, so pretty! I love your beautiful cards! Thank you for sharing! Oh the purple stencil! Love that color! Lovely cards. So many wonderful examples using the new Glitter Gel. As usual you have made some beauties. Can't choose a fave this time. Really pretty cards. Love the purple mandala one. Your two cards and tag are simply beautiful, Susie! I’m so glad you used Wild Violet because I love purple, but honestly all of these colors are gorgeous. What a great release and fun hop! Thanks for the inspiration! WOW! I love your colors! JUST GORGEOUS! These stencils and pastes are a must have! Thank you for being a friend is AMAZING!! My favorite and love the colors. They are popping girl! The black vines are gorgeous. The purple card is spectacular. Beautiful cards and tag! I especially love the tag! Thanks for all the inspiration! The purple background is awesome! The black glitter gel is just so elegant, I love it! Great cards. Black with just a touch of pink is stunning! your cards are Gorgeous! love the purple, I can't wait to get some of this glitter gel! Loved the lady bug card! So fabulous--love the colors and sparkle. I love and admire your work Susie! OHH, thought I had scaled down which Glitz Glitter I need to order but now I have to have black and purple. Beautiful cards and wonderful ideas. Thnks for sharing. Looking forward to trying some of these hop looks and techniques. Thanks for sharing! So pretty. Loving the sparkle! Beautiful cards! 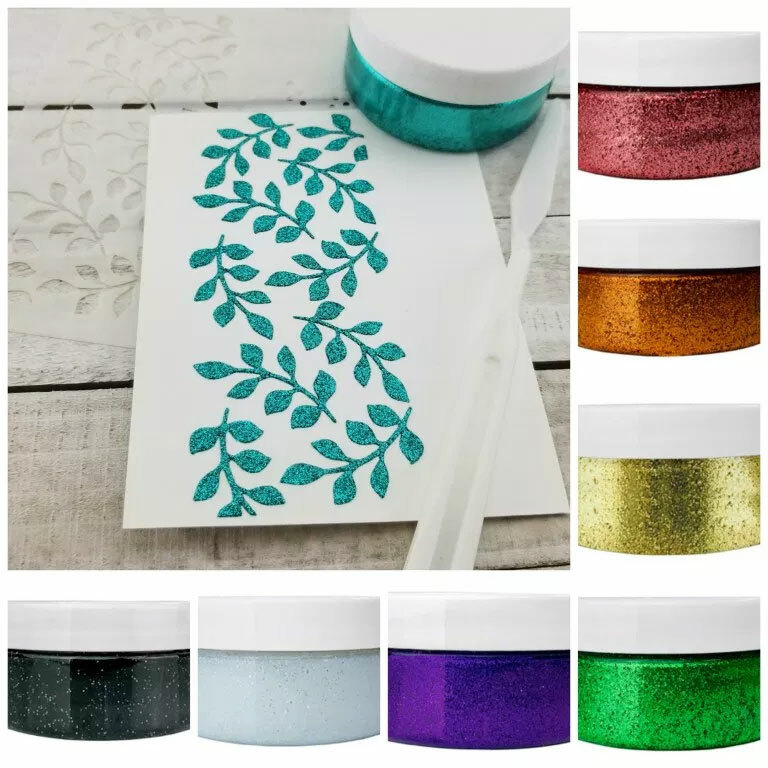 Thought I wouldn't need the black glitter gel but your card using it is absolutely stunning! Guess I do need it after all! Your projects were are just beautiful. I just loved that sweet tag....I need to make a few of those. Spring is in the air. Thank you so much for sharing your lovely work. Beautiful cards and tag! love the look of the Glitz Glitter Gels! Oh what gorgeous projects. Such striking designs and fabulous inspiration using all things that sparkle and shine :) Makes a girl happy. What delightful projects. Love all the sparkle!!! That tag would make such a pretty bookmark. Nice job on these! Awesome cards! I am in love with this product...gonna go broke!! Your cards are beautiful. I love the purple card so much, that is one of my favorite colors in the glitter gel. The cards are so pretty, but that tag is excellent - just love it! Love your beautiful projects! So much to love in this release. I am loving all the products in this release. Your tag is beautiful and probably my favorite. Thanks for the inspiration. Omg! So pretty! Love the glitter gel and your techniques. All 3 are just amazing! Beautiful cards! I especially love the one with black and a touch of pink. Really pops! I really enjoy seeing all of the different creations in this blog hop! So many unique ways to use Gina’s new release products! Love your creations! All of these designs are great, the use of the glitter gels, and the rest of the new release is wonderful Thanks for sharing. Love your gorgeous cards and tag Susie! Only you & Rema used the purple glitz glitter gel, my favorite color! 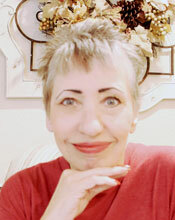 Your designs are so very gorgeous. I am so inspired by your work. I hope to be able to order those glitter gels one of these days...I think they are so pretty. 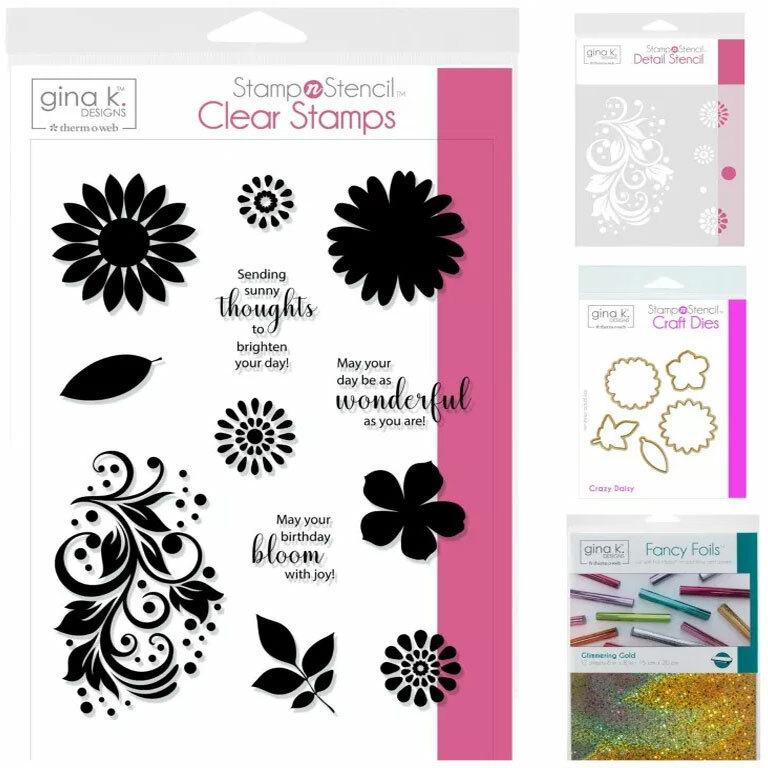 And, I have stencils they would be great with. Yes, I do love all these new products. Thanks for showing them so beautifully. Fabulous cards! I love that last card with the purple! 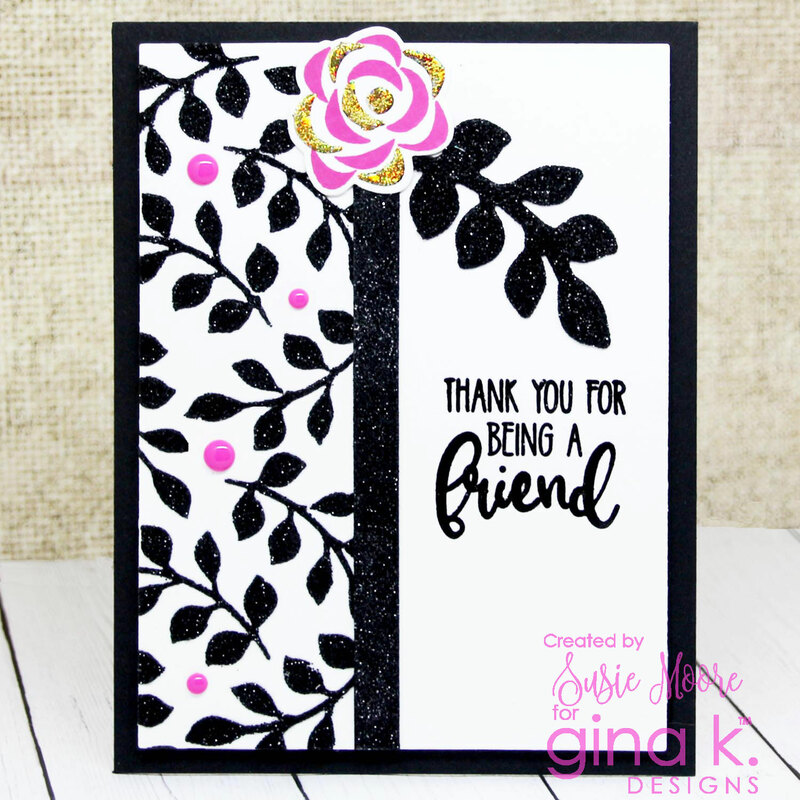 Love the pink/black/white card -so classy! I am so loving that black glitter gel cards...magnificent. Love these great creations today! Beautifully designed cards and colors. I love all the sparkle and shine on your pretty cards! SO fun! I liked your use of the stencils, especially the tag! Thanks for your wonderful inspiration! Love your cards! Loved all of your cards Susie! Thank you for sharing and for your inspiration! The black one is my favorite. Came out awesome. Loving the product. Cant wait to try it. Just beautiful. 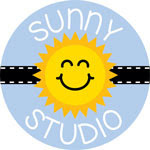 ok.. headed to Gina K Design to place an order for gel and stencils! !